Creation #212. Bonsai Wisdom 15. 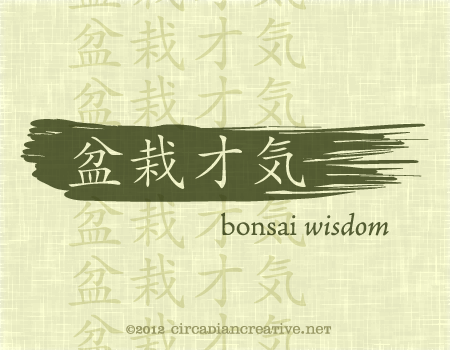 Today I present to you yet another identity concept for Bonsai Wisdom. I will continue to refine my ideas for Bonsai Wisdom’s identity and style in the coming days and weeks but I fear I may be boring my audience here by posting every little variation. I will admit, as I have done previously, I am prone to being lazy with the posts. Circadian Creative 2012 was probably not the best plan for me this year as it has interfered with several other personal projects. Projects I hope will yield me more paid work in the long run and this is my excuse to you for getting lazy with the posts. But enough about that. 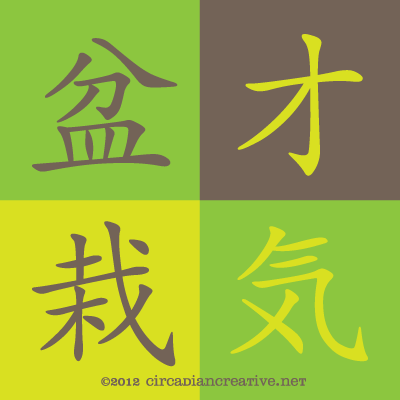 I am as committed to Circadian Creative 2012 as any other project and I am not giving up! I am also committed to you who follow and have felt a bit guilty for just throwing something up some days. So, with that being said I thought of a neat idea for an August theme today as I was researching Japanese culture and concepts. I have been doing some light research for the Bonsai Wisdom project. 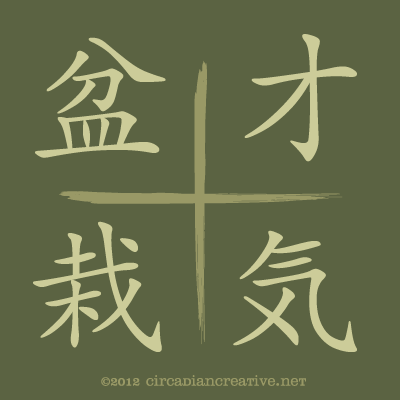 Without getting into much detail my research has pointed me toward a few eastern and Japanese concepts, one being wabi-sabi. 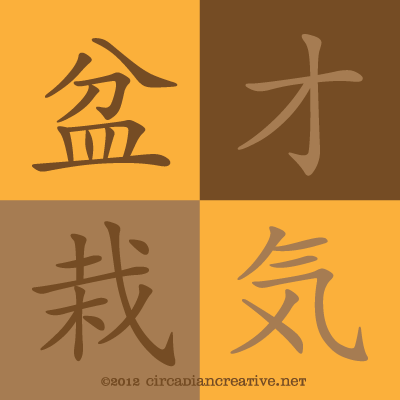 Wabi-sabi is easily translated, unfortunately from what I’ve read the translation or definition does not actually capture the essence of what wabi-sabi is. Over the next several days I will tell you a little bit about my knowledge of wabi-sabi and accompany the commentary with a photo taken by me from that day. The photo will depict wabi-sabi. Tune in tomorrow for wabi-sabi 01! Until then I leave you with tonight’s Bonsai Wisdom design. Creation #211. Bonsai Wisdom 14. Creation #210. Bonsai Wisdom 13. Creation #209. Bonsai Wisdom 12. Sorry I’ve not been very talkative lately. I’d like to say I’ve been busy with other work but honestly I’ve been taking a short break and just cranking out some quick and easy daily designs each evening. I have only set up twice in my home office this week and have been watching informative videos or reading after completing my daily designs. 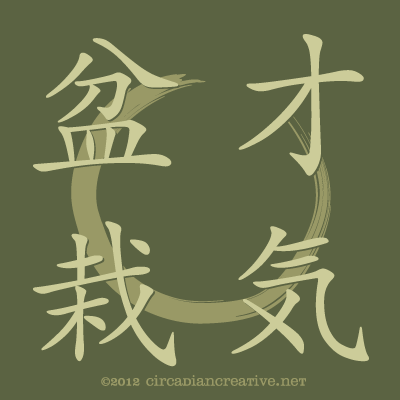 The series of Bonsai Wisdom pieces you’ve been seeing have really been helpful to me in hashing out identity ideas and other visual concepts for a blog project I am hoping to launch by the end of the year. The past four designs have been a simple color scheme change of the same design. The intent is an expression of changing seasons. The idea being that a tree’s structure may not change much but it’s color will with each season. My thought is to possible change the color scheme of the blog with the seasons. I started with summer in Creation #206 and ending with spring with today’s color scheme. Creation #208. Bonsai Wisdom 11. Creation #207. Bonsai Wisdom 10. Creation #206. Bonsai Wisdom 9.